Okay. So you've been holding out placing an order during Sale-a-Bration, because you remembered last year Sale-A-Bration came out with additional Free selections part way through the Sale-A-Bration event. As you know, Sale-A-Bration runs from January 3 until March 31. Some of you have already received free selections from the first release of Sale-A-Bration gifts, and you were trying to decide what else you wanted to select as your free gift with your next $50 order. You were wondering if Stamping Up! would add more items to Sale-A-Bration, like they did last year. We'll, they did! Today, I'm showing a sneak peek of one of the new items from the Sale-A-Bration Second Release of free gift selection -- the Blossoming Basket Bundle. Most free selections are free with a $50 order. However, this year, Stampin' Up! selections include a few gift selections with a $100 order. The Blossoming Basket bundle is one of the items available with a $100 order. This set includes the Blossoming Basket Stamp Set + the Basket Weave Dynamic Textured Impression Embossing folder. 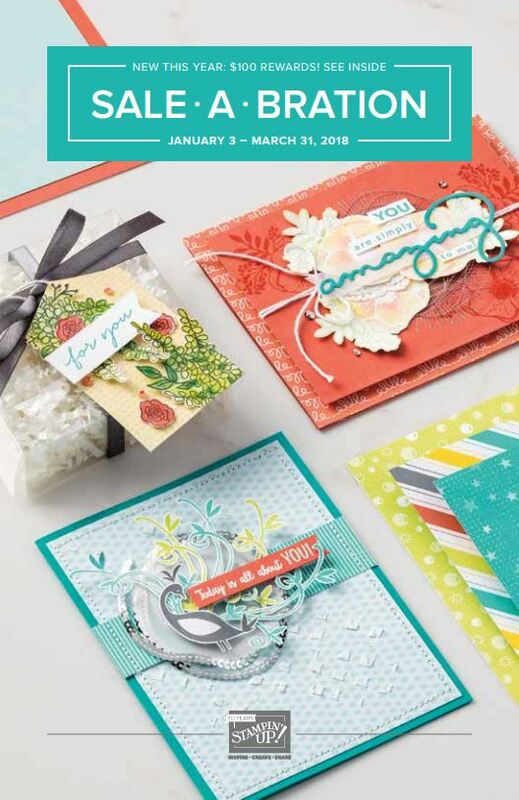 There is also a note in the Second Release flyer that reads: "Embossing Folder will be available in the 2018-2019 annual catalog." Stampin' Up! typically doesn't carry over Sale-A-Bration items once Sale-A-Bration ends. Items typically retire at the end of Sale-A-Bration. So this is a rare opportunity to select an item that will remain current longer. And you're sure to want this set! The base of the card is Thick Whisper White. Then a layer of Pear Pizzazz in a basket weave created with the Basket Weave Dynamic Textured Impressions Embossing Folder. The basket image is stamped on Whisper White and matted with a layer of Night of Navy. The Sentiment is also from the Blossoming Basket Stamp Set. The full Sentiment reads "Here for you". However, I just stamped the "for you" from the sentiment. The sentiment is die cut using the smallest oval from the stitched Shapes Framelit dies, and it is matted with a Night of Navy Scalloped oval from the Layering Ovals Framelit dies. The basket is stamped in Memento Black ink to avoid bleeding when using Blends. The flowers are colored with the Light Calypso Coral Blends and the Light Daffodil Delight Blends. The basket and tag are colored using the Light Crumb Cake Blends. The leaves are colored using the Light Old Olive Blends. The ribbon is 3/8" Pear Pizzazz Shimmer Ribbon. This is a stunning set that will work for Easter, Mother's Day, Birthdays and many other Spring cards. You'll want to add this to add this bundle to your collection as soon as its available to order. You can begin adding this as a free selection with a $100 order on February 16 through March 31. To order any of the supplies used in today's projects, click on an image below to see larger product images and/or to go directly to my Stampin' Up! store.